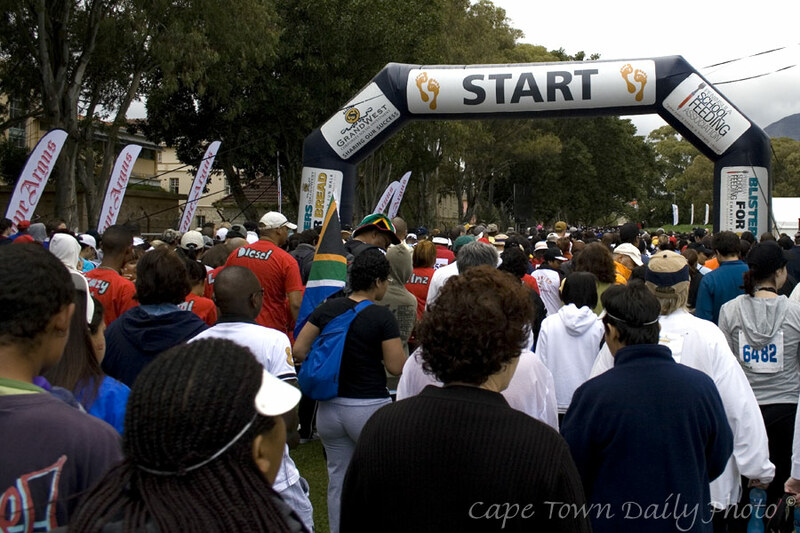 So I discovered today, when we took part in the Blisters for Bread event in Green Point. 10km is in fact a really, really long way to walk! I last took part in Blisters for Bread when I was 7 years old; back then I did the 5km route, and as I recall, it was easy-peasy. Paul pointed out sympathetically that many things were easy-peasy when I was 7, lugging around a total body-weight of about 20 kilograms. I won't tell you what I'm lugging around now, but let's just say that it's a tad more than that. Blisters for Bread is held to raise funds for the Peninsula School Feeding Association, a non-profit organisation that has been providing meals to under-privileged children at their schools for almost 50 years. Sadly, there are many children in our city who don't get sufficient nutrition at home, because their parents are unemployed, sick, or simply don't earn enough to provide proper meals for their family. You can imagine that it's very hard for a hungry child to pay attention in class and succeed at their schoolwork. If you're interested in supporting this cause, you can read more about how to donate money to them here. Posted in General on Sunday, 9 September, 2007 by Kerry-Anne.